Since the beginning of time, man has had a fascination and a longing to own gold. There is evidence of humans wearing gold as early as 4000 BC and it is still popular today and more valuable and sought after than ever. 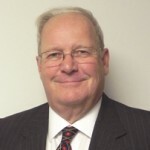 With the current price of gold at this writing being $1,750.00 per one Troy ounce, it only points out how much the world trusts and respects the value of owning it. Gold is a symbol of financial security and success. Mankind’s love for gold is due to its beauty, portability, versatility and ease with which it can be converted to works of art. 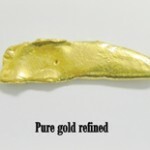 One ounce of pure gold can be struck into a coin or produce a piece of wire that would stretch a mile in length. Gold can also be hammered into a sheet thin enough to transmit light through (Gold Leaf), which is used to letter signs and adorn statuary as well as finish fine quality picture frames. Gold is also used as a conductor of electricity in computers. Gold Jewelry and what you should know about it. Although jewelry can be made of almost any material, such as silver, platinum, stainless, titanium, aluminum, plastic, leather, etc., gold remains the best choice for most jewelry. Since manufacturing equipment and labor is a major factor in the price of creating any item of jewelry it makes sense to use gold rather than metals with no salvage value if the item is damaged or worn in the future. Gold has trade in value as well as more prestige, sense of well being and pride of possession when wearing it. Today there is interest in alternative metals for wedding bands such as Titanium, Tungsten Carbide, Ceramic, and a number of others. The advantage would be they hold their polish and and are very hard. 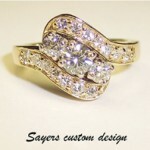 They are very trendy and appeal to the younger generation and they cost only about 25 to 30 % of a similar gold ring. The disadvantage would be they can only be used as wedding bands, not engagement rings. Additionally they cannot be sized, only replaced with another if the company that made them still exists at the time you need a replacement. If it can be replaced it is not the same band you were married with so there is no sentimental attachment to it. It can’t be engraved, only laser etched at the factory. In the case of an accident or injury, it could result in a lost finger if the emergency personnel cannot remove it in a timely manner. We have had patients sent to us because the medical facility didn’t have the proper equipment to remove them. In addition they have all the beauty and luster of a piece of hardware; not very romantic. Gold wedding rings on the other hand can be engraved with your wedding dates, resized many times and refinished to look like new for a lifetime. Gold can be passed on to a future generation or cast into a new design if no longer needed as a wedding ring. It also has salvage value that can be used for a trade-in or sold for cash anywhere in the world making the initial cost a real bargain in the end. Types of gold used in jewelry. 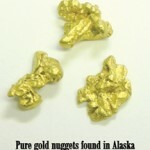 Pure gold as it comes from the earth or a refiner is called 24 Karat, which is much too soft to use for jewelry. For manufacturing into jewelry, alloy metals are added to give the gold strength and workability. Most jewelry in this country is 14K, which is 14 parts pure gold and 10 parts alloy metal such as copper, silver, and zinc as well as nickel, used in the manufacture of white gold. In Europe 18k is preferred and sometimes 22k, both of which are softer than 14k but have a higher purity. Class rings and lower price point jewelry is often made of 10k. Purity is as follows: Stamped 10K or 417 (41.7%), 14k or 585 (58.3%), 18K or 750 (75%) and 22K or 915 (91.6%) pure gold. Jewelry less than 10k is not allowed to be called gold in the U.S.
Gold Stamping Act: It is illegal to stamp 14k or any other quality in a ring without a registered trademark next to it to identify the manufacture responsible for the purity indicated. 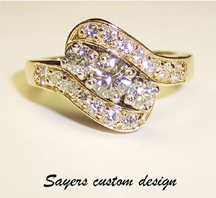 It is legal to sell an item of jewelry with no stamp but if it has a stamp, it must also have a registered trademark. 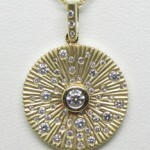 About Quality: The fact that an item is made of karat gold does not guarantee it will hold up to normal wear. Thin ring shanks and hollow chains save gold and sell for less but break and wear out quickly and end up as scrap gold. 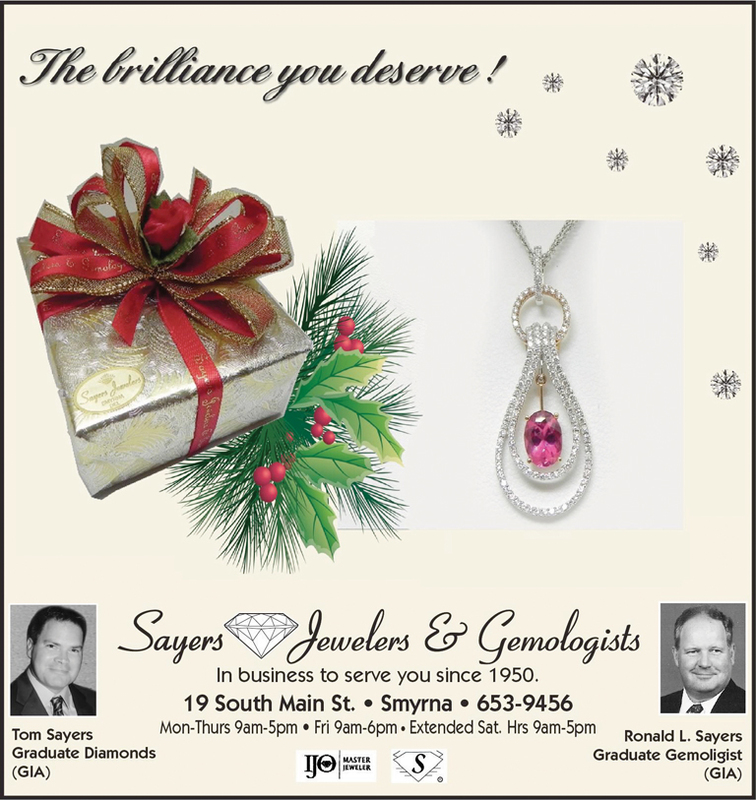 Well-designed jewelry with sufficient metal content will last a lifetime if cared for properly. Platinum and silver are other metals used in the manufacture of jewelry but space does not permit a full discussion of them in this article. 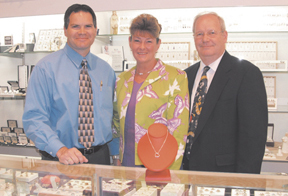 Please stop by our store and we will be glad to answer any questions about them. • Dear Ron, My father and I thank-you for the time that you spent with us. The information that you shared with us about our 3.01 carat diamond was very useful. Wishing you good health and prosperity… Yours truly, ~ Holly R.
← Previous Story Why The Gift of Jewelry?